Professional film makers Lech and Inci Wojas have recently started work on a film documenting El Chorro, it's people and the Bolt Fund. It is all in the early stages, but filming has started and a teaser trailer is on the way. We also need a lot help with making the film in the form of extra pairs of shoulders to carry loads. If you want to help with that it would be much appreciated too. Rockfax and UKC showed their continued support for the bolt fund yesterday by taking on the hosting of our website. This has brought us excellent exposure and helped to make our site stable and fast. They have also helped us to join UKBoltfund.org an excellent site supplying information, news, and a much appreciated source of donations. Thanks to everyone involved in getting this together! This year, RockFax started a huge campaign to support to bolt funds across the UK. They posted a story about the scheme on their website and have now happily agreed to support the El Chorro Bolt Fund too. This is the first time we know of that a UK guidebook company has pledged financial help to a bolt fund in Spain, possibly even the world! We are very grateful for the help, and look forward to making it count with some much needed repairs on classic routes, and quality new lines as we find them. Anyone who climbed these two classic routes in the last couple of years will be forgiven for worrying a little when lowering off. The rusty snapgate on offer was well worn through and did not inspire much faith. This is not really acceptable for routes of this calibre that receive so much traffic, so Tom and Roy from the El Chorro Bolt Fund Team went and replaced them with nice shiny new chains! Both the routes are fantastic and well worth climbing, and now you can feel safe lowering off them and setting top ropes. Roy showing off his rusty trophy! call for images and stories! If you have pictures of bolts and anchors in El Chorro, or any stories relating to the bolt fund, please contact us so we can include them in the site. 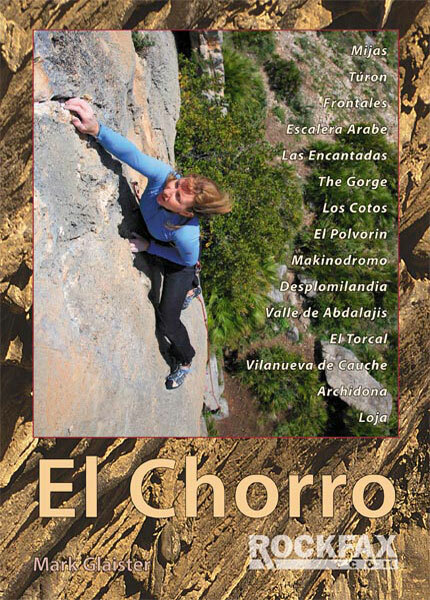 The El Chorro Bolt Fund website will soon be launched, just in time for a new season of climbing and bolting in the area. Watch this space for more news, pictures, videos and topos. --------elchorroboltfund.com--------. Simple theme. Powered by Blogger.